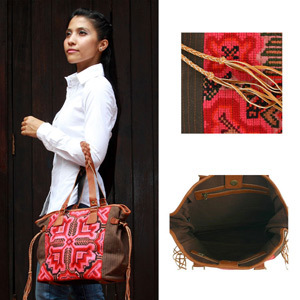 By artisan Chirada Loetparisanyu, this magnificent shoulder bag is crafted of cotton and leather. Hand stitched and hand embroidered patterns from the talented hill-tribe artisans bring amazing colors to the contemporary design. Lined with cotton, the interior features two zipped inner pockets. 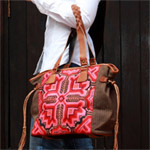 The shape of the bag can be slightly altered by pulling on the braided leather cords placed on the sides. The bag itself closes with a magnetic snap button.